PC-3000 HDD. How to find out the problems in WD Marvell drives. 1. The drive is spinning when powered on, make several (2-11) clicks and then stop, DRD, DSC and ABR registers are on. To check if PCB is good we need to find the same model donor PCB, move ROM chip or read, and then write a patient ROM image into a donor PCB, screw it to a patient HDA and power on the patient. If it click again, the problem is not in PCB. It is possible to check if ROM is original or not if we have Service Area access. 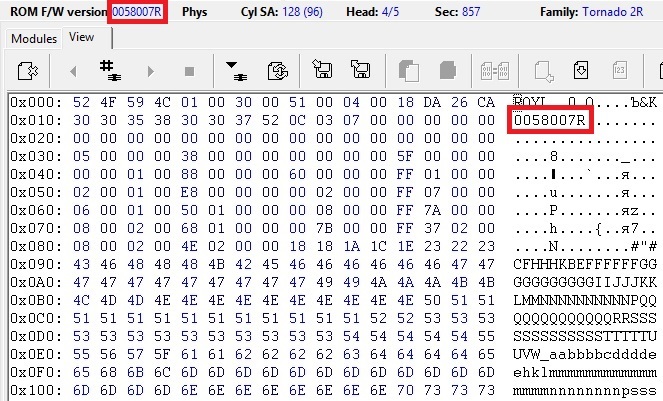 It is enough to compare ROM FW Version with the header of 51 or 11 modules: if ROM is original, versions will match or differs by one last symbol. 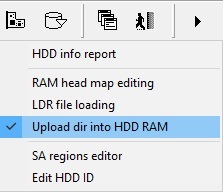 Please remember about new drives which can operate with RAM head map only if loader has been uploaded in RAM. If RAM head map changing does not help, and drive clicks and stops with one of system heads in RAM, look for a new heads, of perform a Hot-Swap procedure to get Service Area access. Close date and same country of manufacture. 1. Connect he same ROM FW version donor to PC-3000. Drive must stop spinning. Now, do not unplug the SATA and power cables, and unscrew the donor PCB from the HDA, and screw it to patient HDA. 4. 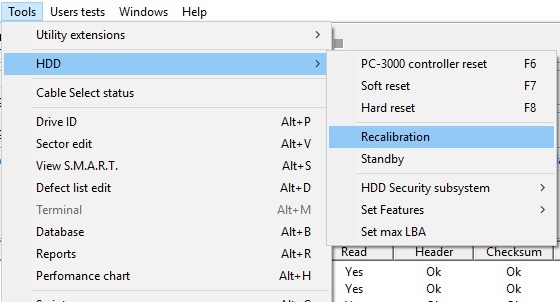 In the same Marvell utility follow Tools -> HDD -> Recalibration. After that the patient drive must spin up. 5. 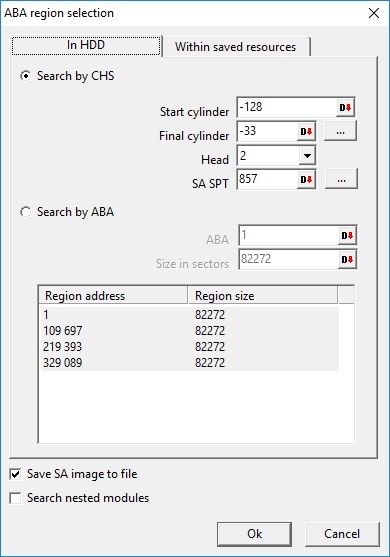 Now follow Tools -> Utility extensions -> Module search in SA. 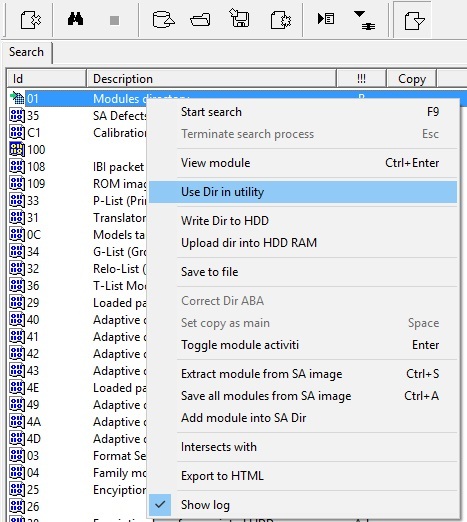 find 01 module, press right mouse button on it and choose Use Dir in utility. After these actions all modules should appears in Tools -> Utility extensions -> Modules directory, and we can check them, save or change. d) bad heads and scratched surface of magnetic platters. If platters are scratched or dusty, it is necessary to remove the dust from HDA using a special cleaning procedures, make the head under bad surface do not touch this surface, disable bad head in RAM head map, and work with Service and User area by the other heads. 2. The drive is spinning and do not stop, but start in utility with empty ID and no service area access. The problem could be in one of Service Area modules damaging. Find the same ROM version donor or a Service Area backup from the same donor, and upload a loader into a RAM. Restart the Marvell utility, do not restart the drive (do not power it off\on). Drive start with default ID (-XYZ-). 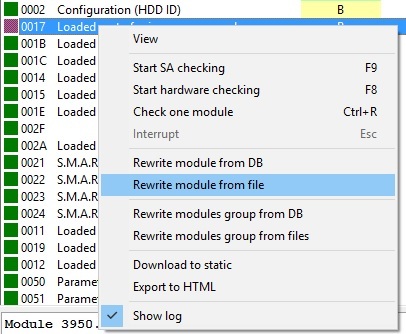 Start the utility in Normal mode, open the Modules directory, run SA modules checking by pressing the small black “Play” button. If some modules are bad (marked as red), write them from a backup. 3. The drive starts very slow, get in BUSY state in attempt to start the utility or read it’s ID. The problem could be in Slow Responding. Drive starts and spins, but get in ready state for a very long time, and fall in BUSY state in attempts to read ID. 4. The drive starts normally, read it’s ID and all modules looks good, but still no user area access. In a drive initialization process all heads are passing the start head test. If some head is weak and has reading or writing problems, the drive will not allow to read the User area for all heads, no matter if other heads are good or not. Sometimes the heads in WD drives are good enough to read and write in Service Area, but too weak to work with User Area. All other cases may consist of combinations of the above situations, we will not observe them in this article.